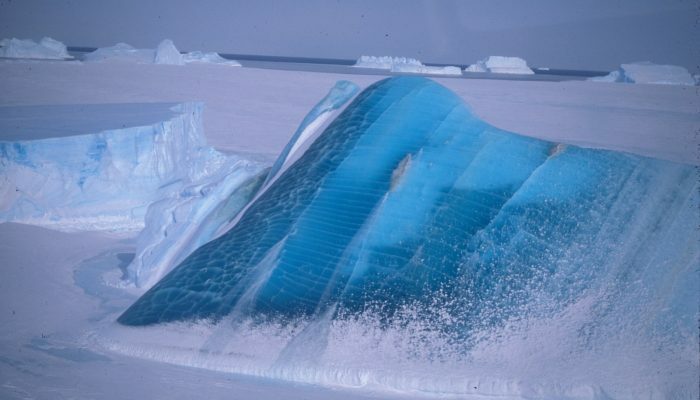 Fig.1: Clear blue marine ice visible on an upturned iceberg [Credit: Stephen Warren]. What are icebergs made of? Fig.2: An iceberg with ‘scallop’ indentations [Credit: Stephen Warren]. Icebergs are chunks of ice which break off from land ice, such as glaciers or ice sheets (as you’ll know if you remember our previous post on icebergs). This means that they are mostly made up of glacial ice, which is frozen freshwater from accumulated snowfall. However, in some places where ice sheets extend to the coastline, making an ice shelf, icebergs can be made up of a different type of ice too. Ice shelves can descend far down into the ocean. Seawater in contact with the ice at depth in the ocean is cooled to the freezing temperature. Because the freezing temperature decreases with decreasing pressure, if the seawater moves upwards in the ocean, it will have a temperature lower than the freezing temperature at that depth. That means it’s super-cooled – the seawater temperature is below the freezing temperature, but it hasn’t become a solid. The seawater cannot last for long in this state and freezes to the base of ice shelves as marine ice, which is seawater frozen at depth. The marine ice can help stabilize the ice shelf as it is less susceptible to fractures than glacial ice. Icebergs that calve from Antarctic ice shelves can sometimes be mixtures of glacial ice (on the top) and marine ice (on the bottom). What can icebergs tell us? 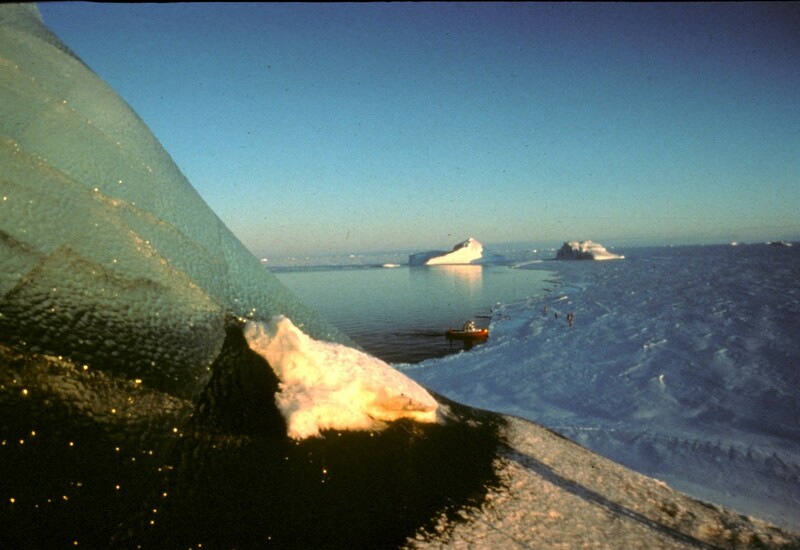 Icebergs which tip over can tell us about processes that happen at the base of ice shelves. For example, scallops on the ice (the small indentations that can be seen in the second picture) can show the size of turbulent ocean eddies in the ocean at the ice shelf base. Basal cavities or channels show where oceanic melt had a large impact. Any colours visible in the iceberg can also give us information. Fig.3: Marine ice containing organic matter, giving a greenish appearance [Credit: Stephen Warren]. Why are icebergs different colours? Like snow (see this previous post), different types of ice appear different colours. A typical iceberg is white because it is covered with dense snow, and snowflakes reflect all wavelengths of ice equally. The albedo of snow, which is the proportion of the incident light or radiation that is reflected by a surface, is very high (nearly 1). Glacial ice is compressed snow, meaning it has fewer light-scattering air bubbles, so light can penetrate deeper than in snow, and more yellows and reds from the visible spectrum are absorbed. This results in a bubbly blue colour, with a slightly lower albedo than snow. Marine ice does not have bubbles, but light can be scattered by cracks, resulting in clear blue ice (see our Image of the Week). However, if the seawater from which the marine ice was formed contained organic matter, like algae and plankton, the resulting marine ice can have a yellowish or even green appearance (Fig. 3). If the marine ice formed near the base of an ice shelf where it meets the sea floor, it could contain sediment, giving it a dirty or black appearance. Warren, S. G., C. S. Roesler, V. I. Morgan, R. E. Brandt, I. D. Goodwin, and I. Allison (1993), Green icebergs formed by freezing of organic-rich seawater to the base of Antarctic ice shelves, J. Geophys. Res., 98(C4), 6921–6928, doi:10.1029/92JC02751. Brad Herried, Antarctic cartographer at South Pole. [Credit: Brad Herried]. Mapping Earth’s most remote continent presents a number of unique challenges. 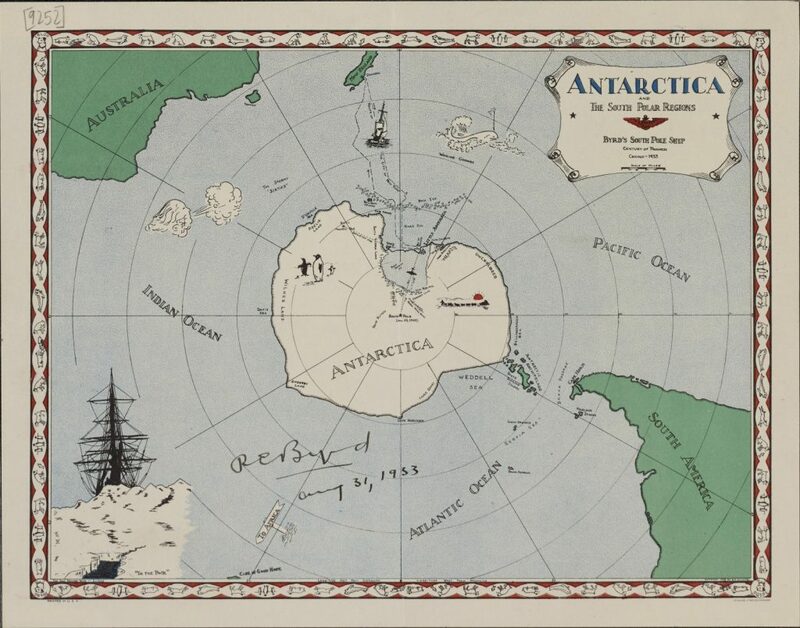 Antarctic cartographers and scientists are using some of the most advanced mapping technologies available to get a clearer picture of the continent. 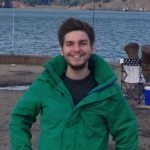 We asked Brad Herried, a Cartographer and Web Developer at the Polar Geospatial Center at the University of Minnesota, a few questions about what it’s like to do this unique job both on and off the ice. Before we go too much further… what is the Polar Geospatial Center, and what does it do for polar science and scientists? 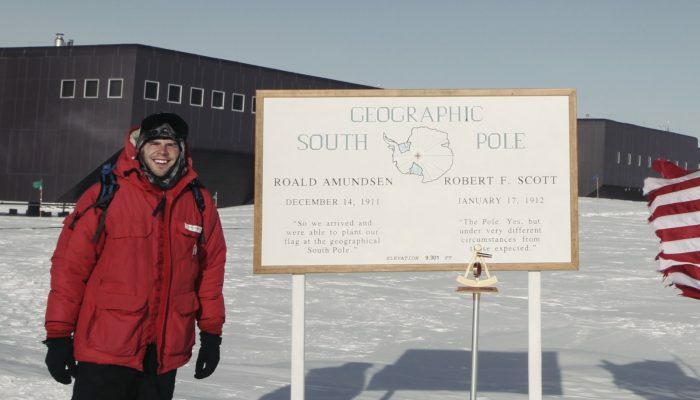 The Polar Geospatial Center (PGC), founded in 2007 by Director Paul Morin, is a research group of about 20 staff and students at the University of Minnesota with a simple mission: solve geospatial problems at the poles (Antarctica and the Arctic). 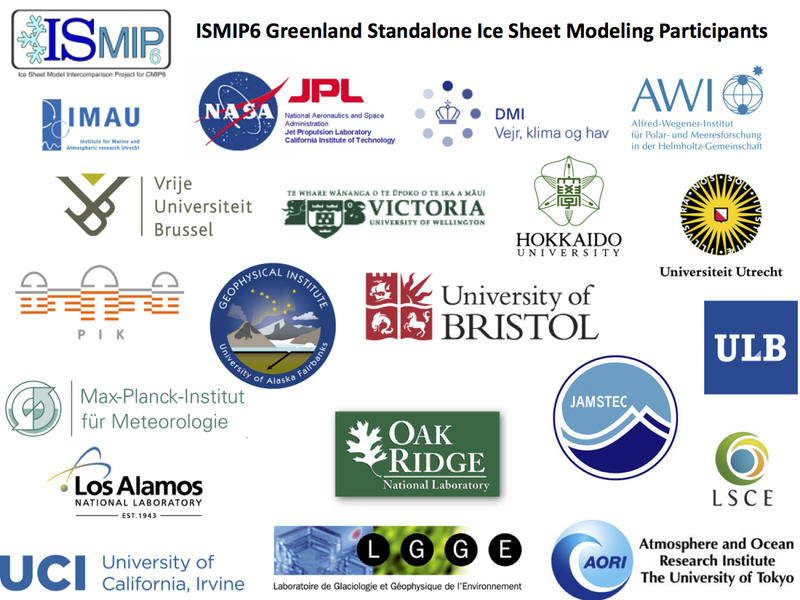 Because we are funded (primarily) through the U.S. National Science Foundation (NSF) and NASA Cryospheric Sciences, that is the community we support – other U.S.-funded polar researchers. We provide custom maps, high-resolution commercial satellite imagery, and Geographic Information System (GIS) support for researchers who would like to use the data for their research but may not have the expertise to do so. Our primary service is providing high-resolution satellite imagery (i.e. from the DigitalGlobe, Inc. constellation) to U.S.-funded polar researchers – at no additional cost to their grants – through licensing agreements with the U.S. Government. It has proven beneficial to researchers to have a service so that we do the hard parts of data management, remote sensing, and automation of satellite imagery processing so that they don’t have to. So, a glaciologist or geomorphologist or wildlife ecologist studying at the poles may come to us and say: I would like to use satellite imagery to study phenomenon x or y. Some groups use it just for logistics (these are some of the least mapped places on Earth after all) to get to their site. Some groups’ entire research is done using remote sensing. What kinds of data and resources do you use? The PGC’s polar archive of high-resolution commercial imagery is absolutely astounding (like, in the thousands of terabytes). The imagery, although licensed to us by U.S. Government contracts, is collected by the DigitalGlobe, Inc. constellation of satellites (e.g. WorldView-2), much like the imagery where you can see your house/car in Google Earth. The benefit is that we can provide it at no cost to our users (researchers). That resource, along with the expertise of the staff at PGC, can provide solutions to users, whether it’s making a simple map of a remote research site or providing a time-series of satellite imagery for a researcher studying change detection (like, say for a glacier front in Greenland). This also presents a challenge. How do we manage and effectively deliver that much data? We have relied on skilled staff, ingenuity, cheap storage, high-performance computing, and automation to become successful. As the saying goes, automate or die. What’s your role at the PGC? How did you find your way into a job like this? I started at the PGC as a graduate student in 2008. I knew nothing about Antarctica or the Arctic, but my background and studies in GIS & cartography offered a wide range of jobs. After I graduated, I became a full-time employee as the lead cartographer of the (at the time, very small) group. Currently, I do a lot more GIS web application development and geospatial data management. We have recognized the need for more automated, “self-service” systems for our users to get the data they need in a timely manner, and less of asking a PGC employee for a custom product. As the saying goes, automate or die. But, of course, I still spend a fair bit of my times creating maps to keep my cartographic juices going. What kind of work do PGC employees do in Antarctica? The PGC staffs an office at the United States’ McMurdo Station annually from October to February, with 3-5 staff rotating throughout the field season. It is really an extension of our responsibilities, with a couple interesting twists, both good and bad. First, a majority of our users (NSF-funded researchers) come through McMurdo Station in preparation for their fieldwork. It’s a beneficial and unique experience to meet with them one-on-one and solve problems, ironically, faster than email exchanges back in the States. Second – and this is true of all of Antarctica – the internet bandwidth is very limited. So, we have to a) prepare more regarding what data/imagery we have on site and b) do more with less. That always proves to be a fun challenge because it is impossible to access our entire archive of imagery from down there. How could I forget collecting Google Street View in Antarctica. There have been several years, however, when we do get to go out into the field! In past years, we have conducted various field campaigns in the nearby McMurdo Dry Valleys to collect survey ground control to make our satellite imagery more accurate. And, how could I forget collecting Google Street View (with some custom builds of the typical car-camera system for snowmobiles, heavy-duty trucks, and backpacks). 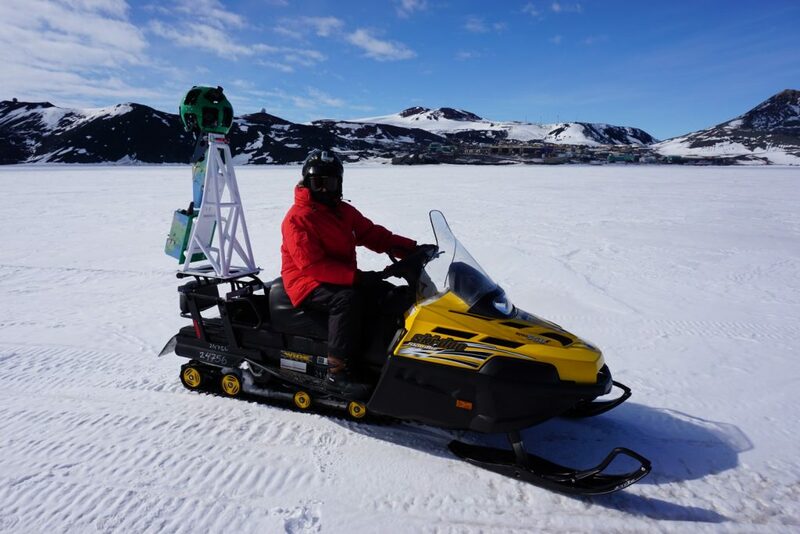 The Google Street View provides a window into the world of Antarctica – history, facilities, science, and of course its beautiful landscapes – to a wide audience who only dream of visiting Antarctica. What are some of the interesting projects PGC has worked on? What’s exciting at PGC right now? There’s not exactly a ton of geospatial data or maps for the polar regions, especially Antarctica. Where it gets really interesting is how we can apply our archive of satellite imagery to help researchers solve problems or come up with cutting-edge solutions with the data. One example is the ArcticDEM project. 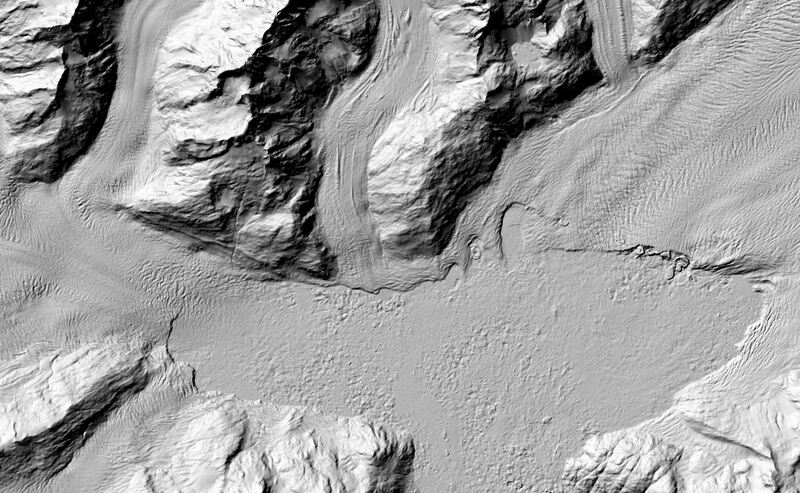 In a private-public collaboration, PGC is using high performance computing (HPC) to develop a pan-Arctic Digital Elevation Model (DEM) at a resolution 10 times better than what exists now. This project requires hundreds of thousands of stereoscopic satellite imagery pairs to be processed using photogrammetry techniques to build a three-dimensional model of the surface for the entire Arctic. There are countless more applications for the imagery and we’ll continue to push the limits of the technology to produce innovative products to help measure the Earth and solve really important research questions. ArcticDEM hillshade in East Greenland. DEM(s) created by the Polar Geospatial Center from DigitalGlobe, Inc. imagery. [Credit: Brad Herried/ Polar Geospatial Center]. What resources can cryosphere researchers and other polar scientists without US funding get from PGC to enhance their research? Our website provides a wealth of non-licensed data, freely available to download. That includes our polar map catalog (with over 2,000 historic maps of the polar regions), aerial photography, and elevation data. 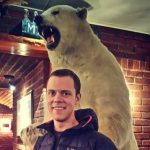 The ArcticDEM project I mentioned before is freely available (see https://www.pgc.umn.edu/data/arcticdem/), as are all DEMs created (derived) from the optical imagery. Moreover, we work with the international community on a regular basis to continue mapping efforts across both poles. What advice do you have for students interested in a career in science or geospatial science? This might be a little bit of a tangent, but learn to code. I was trained in cartography ten years ago and we hardly touched the command line. Now? You certainly don’t have to be an expert, say, Python programmer, but you’re behind if you don’t know how to automate some of your tasks, data processing, analysis, or other routine workflows. It allows you to focus on the things you’re actually an expert in (and, employers are most certainly looking for these skills). ArcticDEM hillshade of Columbia Glacier, Alaska. DEM(s) created by the Polar Geospatial Center from DigitalGlobe, Inc. imagery. [Credit: Brad Herried/ Polar Geospatial Center]. Personally, what has been the highlight of your time at PGC so far? 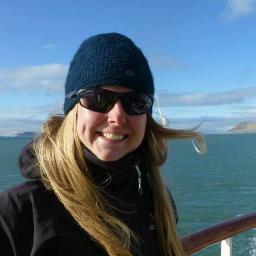 I will never forget the first time I stepped off the plane landing in Antarctica as a graduate student. A surreal, breathtaking (literally), and completely foreign feeling. 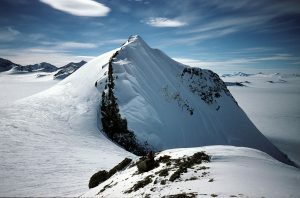 To be able to experience the most remote places on Earth first-hand naturally leads to a better understanding of them. So, the highlight for me is this: I find myself asking more questions, talking to the preeminent researchers and students about their work, and discovering the purpose of it all. I may be a small piece in the puzzle of understanding our Earth’s poles, but I’m humbled to be a part. Fig. 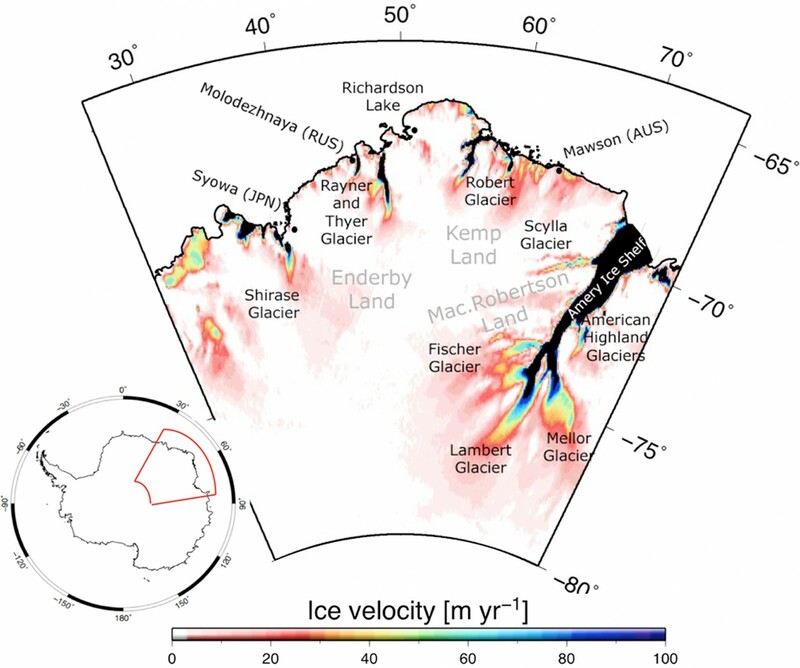 1: Map of ice velocity from the NASA MEaSUREs Program showing the region of Enderby Land in East Antarctica [Credit: Fig. 1 from Kallenberg et al. (2017) ]. The mass balance of an ice sheet is the difference between the mass gain of ice, primarily through snowfall, and the mass loss of ice, primarily via meltwater runoff and ice dynamic processes (e.g. iceberg calving, melting below ice shelves). When the mass gain is equal to the mass loss, the ice sheet is in balance. However, if one exceeds the other, the ice sheet either gains or loses mass. Measuring mass balance changes of ice sheets is crucial due to their potential contribution to sea level rise (see previous post). 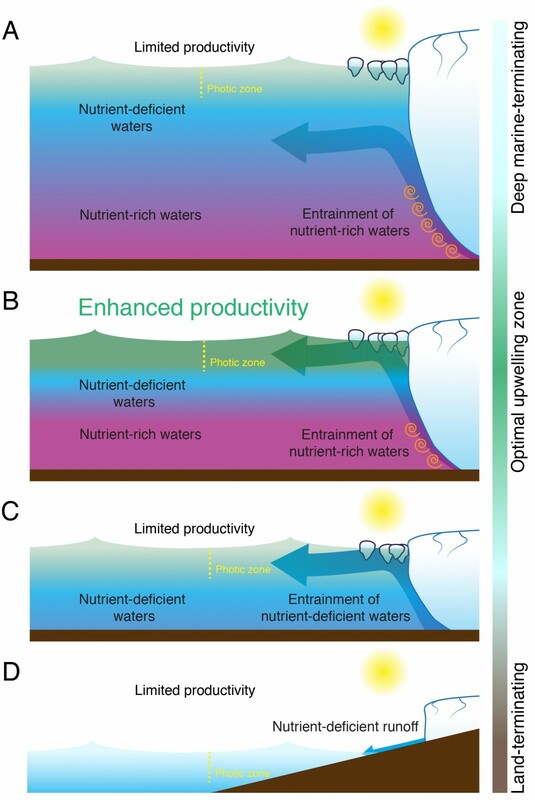 You can have a look at this nice review for further details about the recent changes in the mass balance of the two biggest ice sheets on Earth, i.e. Antarctica and Greenland. 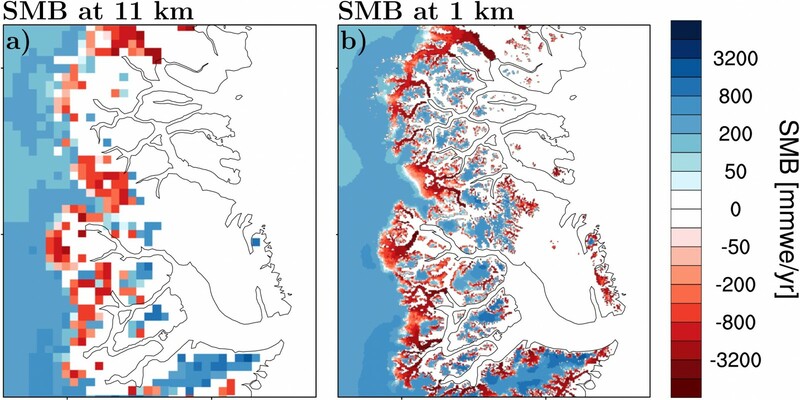 Ice mass changes from snowfall and meltwater runoff (what we call ‘surface mass balance’ changes) are reasonably well simulated by regional climate models, which give good agreement with observations (see this study for Antarctica and this one for Greenland). Mass changes from ice dynamics are more complex to obtain. They are commonly estimated by combining ice velocity and ice thickness. Ice velocity is measured via satellite radar interferometry, while ice thickness is obtained thanks to airborne radar. 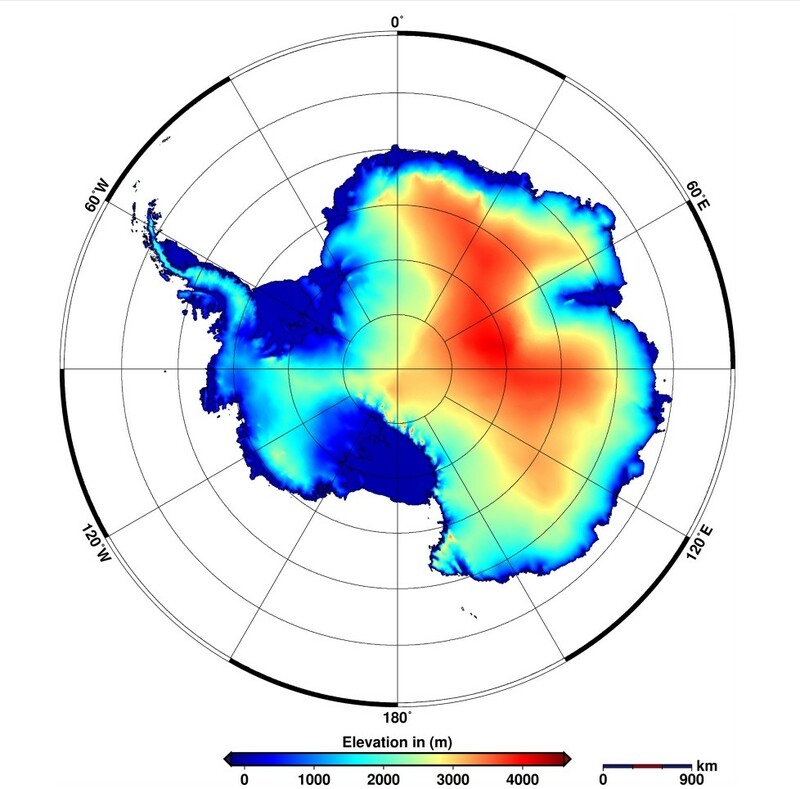 Unfortunately, these measurements have sparse temporal and spatial coverage, especially in Antarctica, which makes the computation of mass changes from ice dynamics challenging. 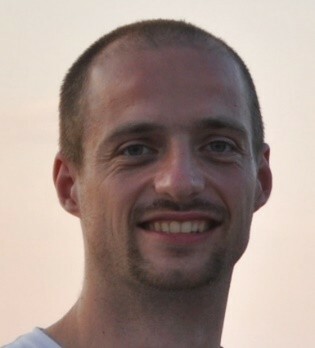 Kallenberg et al. 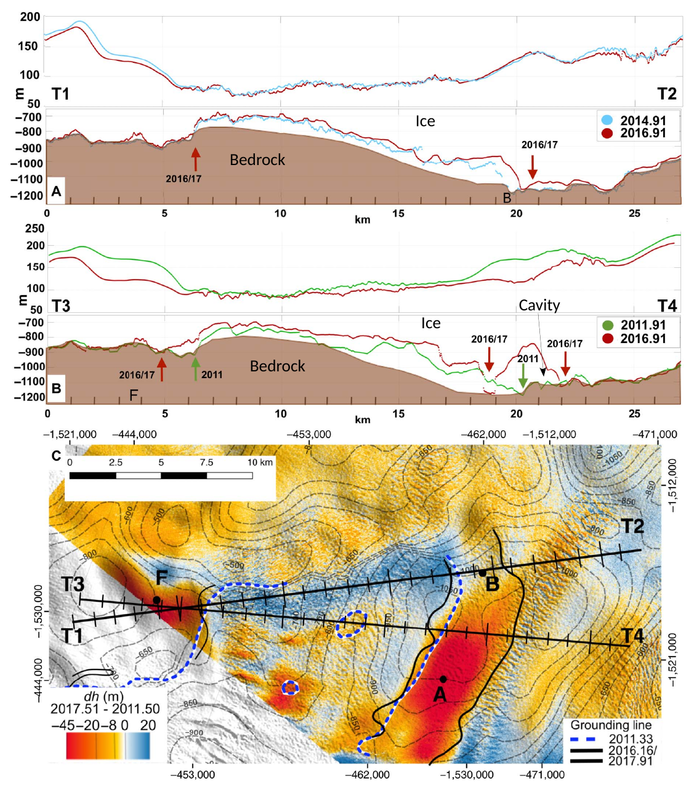 (2017) conducted a study focussing on Enderby Land in East Antarctica (see our Image of the Week) in which they use a novel approach to estimate ice dynamic changes. 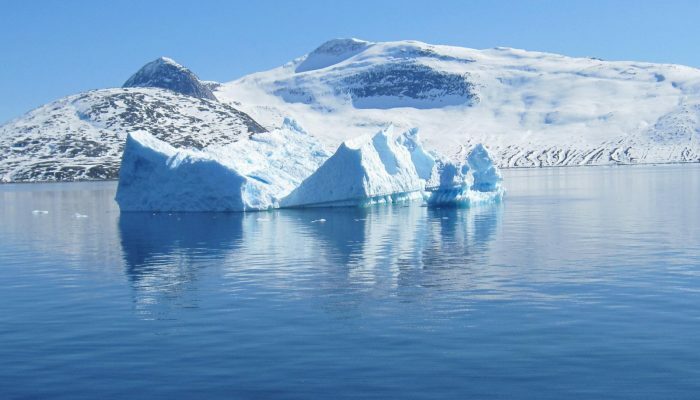 This region of Antarctica has experienced a slightly positive mass balance in past years, meaning that the ice sheet has slightly thickened in this region. Kallenberg et al. (2017) first used satellite observations to compute the total changes in ice sheet mass. They took advantage of two high-technology datasets. The first one, “Gravity Recovery And Climate Experiment” (GRACE), measures changes in the Earth’s gravity field, from which ice mass changes can be derived. A summary explaining how GRACE works can be found in this previous post. The second satellite dataset, “Ice, Cloud, and land Elevation Satellite” (ICESat), measures changes in ice surface elevation, from which changes in ice mass can be computed by using ice density. Surface mass balance changes: changes from processes happening at the surface of the ice sheet (e.g. snow accumulation, meltwater runoff). These changes were obtained from model simulations using the Regional Atmospheric Climate Model (RACMO2), for which details can be found in this previous post. 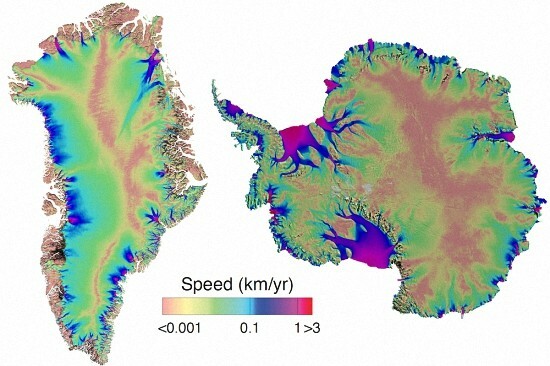 Glacial Isostatic Adjustment: changes in land topography due to ice loading and unloading. These changes were computed from Glacial Isostatic Adjustment models. The results of this study show that it is possible to compute changes in ice mass resulting from ice dynamics with higher spatial and temporal coverage than before, using a combination of satellite observations and models. Also, the use of two different satellite datasets (GRACE and ICESat) shows that they agree quite well with each other in the region of Enderby Land (see Fig. 2). This means that using one or the other dataset does not make a big difference. Finally, this new method also shows that differences between GRACE and ICESat reduce when using the newer version of RACMO2 for computing surface mass balance changes. 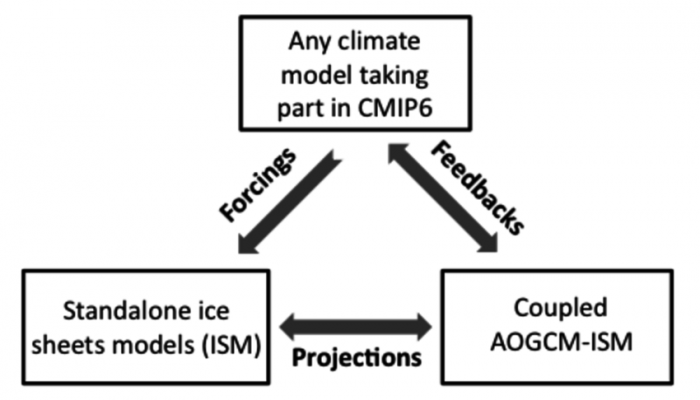 This tells us that comparing results of ice dynamics from both satellites with different models is a good way to identify which models correctly simulate surface processes and which models do not. Fig. 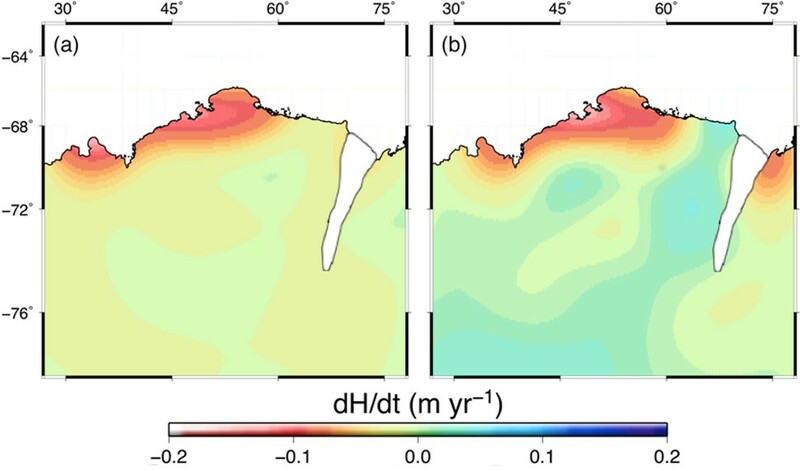 2: Ice dynamic changes (dH/dt, where H is ice thickness and t is time) computed from (a) GRACE and (b) ICESat and expressed in meters per year [Credit: Fig. 5 from Kallenberg et al. (2017) ]. Kallenberg, B., P. Tregoning, J. F. Hoffmann, R. Hawkins, A. Purcell, and S. Allgeyer (2017). A new approach to estimate ice dynamic rates using satellite observations in East Antarctica, The Cryosphere, 11, 1235-1245, doi: 10.5194/tc-11-1235-2017. Hanna, E., F. J. Navarro, F. Pattyn, C. M. Domingues, X. Fettweis, E. R. Ivins, R. J. Nicholls, C. Ritz, B. Smith, S. Tulaczyk, P. L. Whitehouse, and H. J. Zwally (2013). Ice-sheet mass balance and climate change. Nature, 498, 51-59, doi: 10.1038/nature12238. Fig.1: The sleeping quarters at EastGRIP [Credit: Helle Astrid Kjær]. 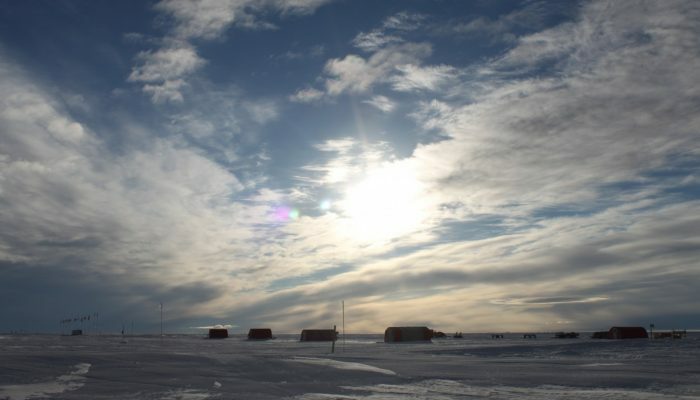 In total, 22 people live in the camp (see Fig.2): 1 field leader, 5 ice core drillers, 4 ice core loggers, 3 people working with the physical properties of the ice, 2 are doing continuous water isotope analysis, 2 surface science scientists, 2 field assistants, and 1 mechanic, 1 electrical engineer and most important an excellent cook. We cover a variety of nationalities: British, Czech, Danish, French, German, Japanese, Korean, Norwegian, Russian and more. 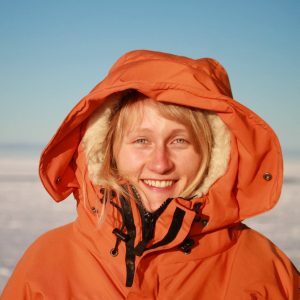 The crew changes every four weeks and the EastGRIP project aims to get as many young scientists (Master and PhD students) into camp as possible, so that it also works as a learning environment for new generations. In total, the number of people that have and will spent time at EastGRIP this season is almost 100, making it a buzzing science hub. This environment leads to extensive science discussions over the dinner table and therefore facilitates the interdisciplinary connections so vital in ice core science. Fig.2: The current crew at EastGRIP dressed up for the Saturday party (tie and dress obligatory!) [Credit: EastGRIP diaries]. 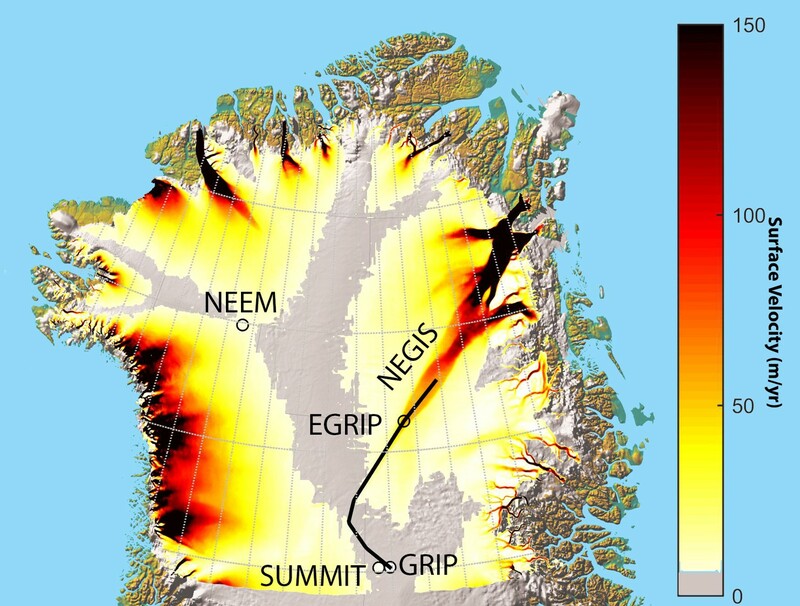 The main aim of the EastGRIP project is to retrieve an ice core by drilling through the North East Greenland Ice Stream (NEGIS) up to a depth of 2550 m (!). Ice streams are responsible for draining a significant fraction of the ice from the Greenland Ice Sheet (see Fig. 3). We hope to gain new and fundamental information on ice stream dynamics from the project, thereby improving the understanding of how ice streams will contribute to future sea-level change. The EastGRIP project has many international partners and is managed by the Centre for Ice and Climate, Denmark with air support carried out by US ski-equipped Hercules aircraft managed through the US Office of Polar Programs, National Science Foundation. unity for us in ice2ice to learn more about how the fast-flowing ice stream in North East Greenland may influence the stability of the Greenland ice cap and to enjoy the collaborative spirit at an ice core drilling site. This year’s fieldwork at EastGRIP started in May and will continue until August. We aim to make it through the brittle zone of the ice. This is a zone where the gas bubbles get enclosed in the ice crystals and thus the ice is, as the name indicates, more brittle than at other depths. Unfortunately for us, the brittle zone makes it very hard to retrieve the ice in a great quality. This is because of the pressure difference between the original depth of the ice and the surface, that causes the ice to fracture when it arrives at the surface. We are doing our very best to stabilize the core and several optimizations in terms of both drilling and processing of the ice core are being applied. Fig. 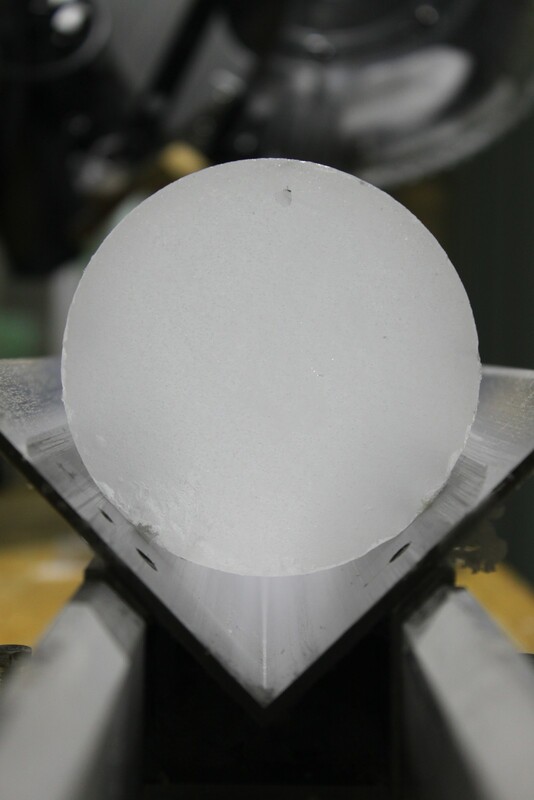 4: Cross-section view of an ice core [Credit: Helle Astrid Kjær]. Still, a large part of the core can already be investigated (see Fig. 4) for water isotopes to get information about past climate. Also, ice crystals directions are being investigated through thin slices of the ice core to help better understanding the flow of the NEGIS. On top of the deep ice core, which is to be drilled to bedrock over the coming years, we are doing an extensive surface program to look at accumulation changes. Fig.5: Visit of a falcon [Credit: Helle Astrid Kjær]. Helle Astrid Kjær is a postdoc at the Centre for Ice and Climate at the Niels Bohr Institute at University of Copenhagen. 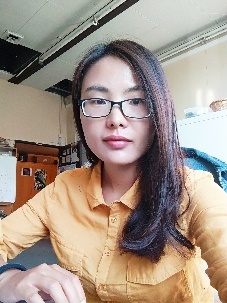 When she is not busy in the field drilling and logging ice cores, she spends most of her time in the lab retrieving the climate signal from ice cores. These include volcanic events, sea salts, dust with more by means of Continuous Flow Analaysis (CFA). Further she is hired to manage the ice2ice project. Today’s Image of the Week shows annual ice flow velocity mosaics at 1km resolution from 2005 to 2016 for the Antarctic ice sheet. These mosaics, along with similar data for Greenland (see Fig.2), were published by Mouginot et al, (2017) last month as part of NASA’s MEaSUREs (Making Earth System Data Records for Use in Research Environments) program. How were these images constructed? The mosaics shown today (Fig 1 and 2) were built by combining optical imagery from the Landsat-8 satellite with radar (SAR) data from the Sentinel-1a/b, RADARSAT-2, ALOS PALSAR, ENVISAT ASAR, RADARSAT-1, TerraSAR-X, and TanDEM-X sensors. Although the authors used the well-known techniques of feature and speckle tracking to produce their velocities from optical and radar images, respectively, the major novelty of their study lies in the automation and integration of the different datasets. How is this new dataset useful? Previously, ice sheet modellers have used mosaics composed of satellite data from multiple years to cover the entire ice sheet. However, this new dataset is one of the first to provide an ice-sheet-wide geographic scale, a yearly temporal resolution, and a moderately high spatial resolution (1km). This means that modellers can now better examine how large parts of the Greenland and Antarctic ice sheets evolve over time. By linking the evolution of the ice sheets to the changes in weather and climate over those ice sheets during specific years, modellers can calibrate the response of those ice sheets’ outlet glaciers to different climate conditions. The changes in the speeds of these outlet glaciers have important consequences for the amount of sea level rise expected for a given amount of warming. How can I start using this data? The yearly MEaSUREs data is hosted at the NSIDC in NetCDF format. The maps shown in the animated image were made using Quantarctica/QGIS (for more information on Quantarctica, check out our previous post E). QGIS natively supports NetCDF files like these mosaics with no additional import steps. Users can quickly calculate new grids showing speed, changes in velocities between years, and more by using the QGIS Raster Calculator or gdal_calc. Image of the Week – Quantarctica: Mapping Antarctica has never been so easy! 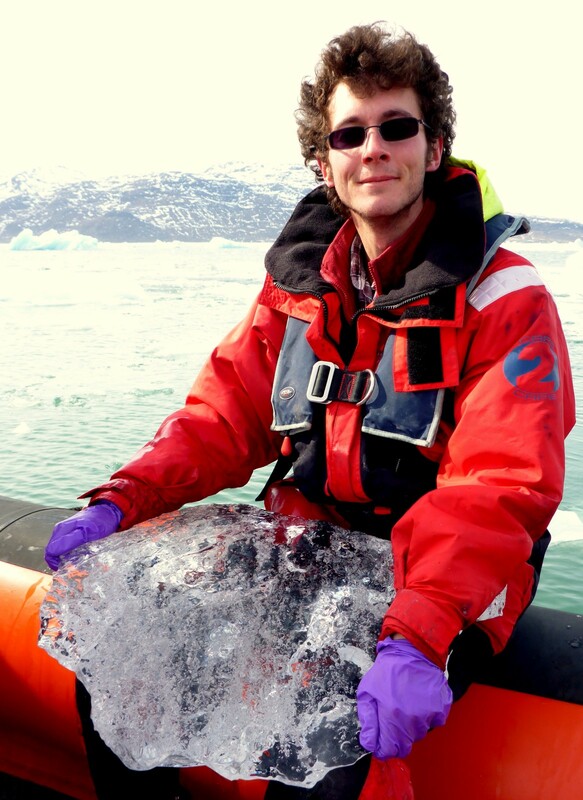 George Roth is the Quantarctica Project Coordinator in the Glaciology group (@NPIglaciology) at the Norwegian Polar Institute. He has spent the last several years helping researchers with GIS, cartography, and remote sensing in both the Arctic and Antarctic. Fig. 1: Surface mass balance (SMB) of the Greenland ice sheet and peripheral ice caps at 1 km resolution averaged for 1958-2015. The interior of the ice sheet (blue) accumulates mass from snowfall whereas the narrow margins (red) lose mass from runoff of meltwater. Yellow dots locate on-site measurements. At this resolution, the small ice caps and marginal glaciers are accurately resolved [Credit: Brice Noël]. Click here here to enlarge the image. The Greenland ice sheet – the world’s second largest ice mass – stores about one tenth of the Earth’s freshwater. If totally melted, this would rise global sea level by 7.4 m, affecting low-lying regions worldwide. Since the 1990s, the warmer atmosphere and ocean have increased the melt at the surface of the Greenland ice sheet, accelerating the ice loss through increased runoff of meltwater and iceberg discharge in the ocean. the ablation zone (red) at the ice sheet margins which loses mass as meltwater runoff exceeds snowfall. the equilibrium line (white) that separates these two areas. To cover large areas while overcoming time-consuming computations, RACMO2.3 is run at a relatively coarse horizontal resolution of 11 km for the period 1958-2015. At this resolution, the model does not resolve small glaciated bodies (Fig. 2a), such as narrow marginal glaciers (few km wide) and small peripheral ice caps (ice masses detached from the big ice sheet). Yet, these areas contribute significantly to ongoing sea-level rise. 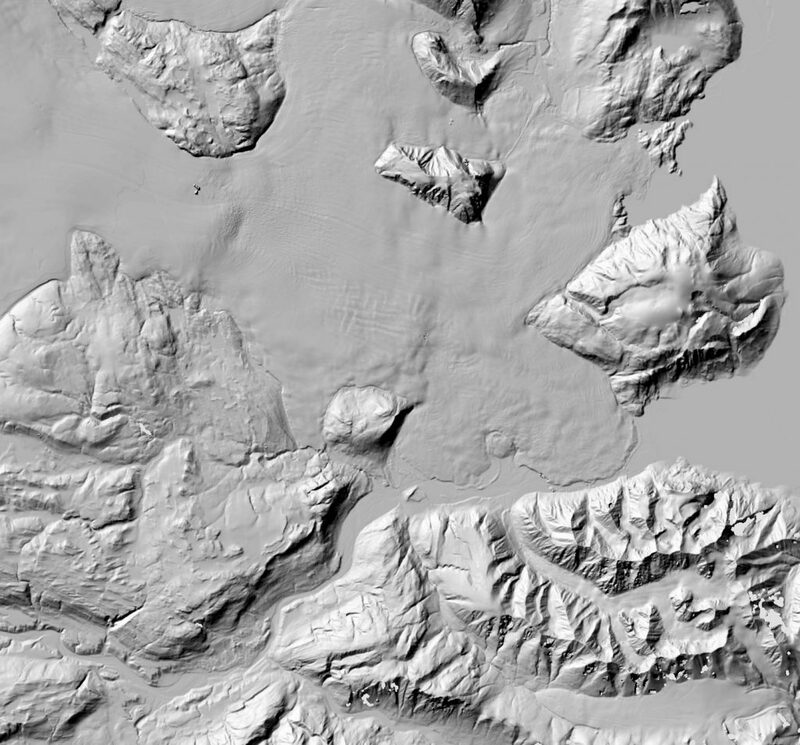 To solve this, we developed a downscaling algorithm (Noël et al., 2016) that reprojects the original RACMO2.3 output on a 1 km ice mask and topography derived from the Greenland Ice Mapping Project (GIMP) digital elevation model (Howat et al., 2014). The downscaled product accurately reproduces the large mass loss rates in narrow ablation zones, marginal outlet glaciers, and peripheral ice caps (Fig. 2b). Fig. 2: Surface mass balance (SMB) of central east Greenland a) modelled by RACMO2.3 at 11 km, b) downscaled to 1 km (1958-2015). The 1 km product (b) resolves the large mass loss rates over marginal outlet glaciers [Credit: Brice Noël]. The high-resolution data set has been successfully evaluated using in situ measurements and independent satellite records derived from ICESat/CryoSat-2 (Noël et al., 2016, 2017). Recently, the downscaling method has also been applied to the Canadian Arctic Archipelago, for which a similar product is now also available on request. Using the new 1 km data set (Fig. 1), we identified 1997 as a tipping point for the mass balance of Greenland’s peripheral ice caps (Noël et al., 2017). Before 1997, ablation (red) and accumulation zones (blue) were in approximate balance, and the ice caps remained stable (Fig. 3a). After 1997, the accumulation zone retreated to the highest sectors of the ice caps and the mass loss accelerated (Fig. 3b). This mass loss acceleration was already reported by ICESat/CryoSat-2 satellite measurements, but no clear explanation was provided. The 1 km surface mass balance provides a valuable tool to identify the processes that triggered this recent mass loss acceleration. Fig. 3: Surface mass balance of Hans Tausen ice cap and surrounding small ice bodies in northern Greenland before (a) and after the tipping point in 1997 (b). Since 1997, the accumulation zone (blue) has shrunk and the ablation zone (red) has grown further inland, tripling the pre-1997 mass loss [Credit: Brice Noël]. Greenland ice caps are located in relatively dry regions where summer melt (ME) nominally exceeds winter snowfall (PR). To sustain the ice caps, refreezing of meltwater (RF) in the snow is therefore a key process. The snow acts as a “sponge” that buffers a large amount of meltwater which refreezes in winter. The remaining meltwater runs off to the ocean (RU) and contributes to mass loss (Fig. 4a). 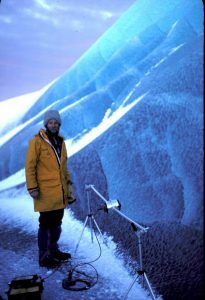 Before 1997, the snow in the interior of these ice caps could compensate for additional melt by refreezing more meltwater. In 1997, following decades of increased melt, the snow became saturated with refrozen meltwater, so that any additional summer melt was forced to run off to the ocean (Fig. 4b), tripling the mass loss. Fig. 4: Surface processes on an ice cap: the ice cap gains mass from precipitation (PR), in the form of rain and snow. a) In healthy conditions (e.g. before 1997), meltwater (ME) is partially refrozen (RF) inside the snow layer and the remainder runs off (RU) to the ocean. The mass of the ice cap is constant when the amount of precipitation equals the amount of meltwater that runs off. b) When the firn layer is saturated with refrozen meltwater, additional meltwater can no longer be refrozen, causing all meltwater to run off to the ocean. In this case, the ice cap loses mass, because the amount of precipitation is smaller than the amount of meltwater that runs off [Credit: Brice Noël]. In 1997, following decades of increased melt, the snow became saturated with refrozen meltwater, so that any additional summer melt was forced to run off to the ocean, tripling the mass loss. 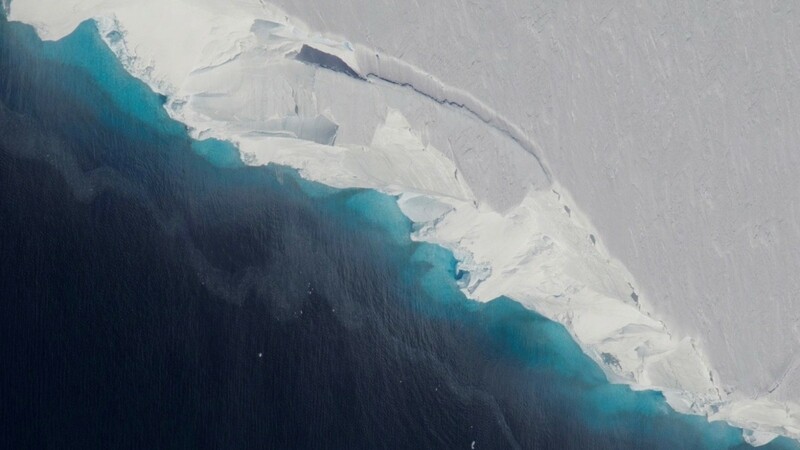 We call this a “tipping point” as it would take decades to regrow a new, healthy snow layer over these ice caps that could buffer enough summer meltwater again. In a warmer climate, rainfall will increase at the expense of snowfall, further hampering the formation of a new snow cover. In the absence of refreezing, these ice caps will undergo irreversible mass loss. What about the Greenland ice sheet? 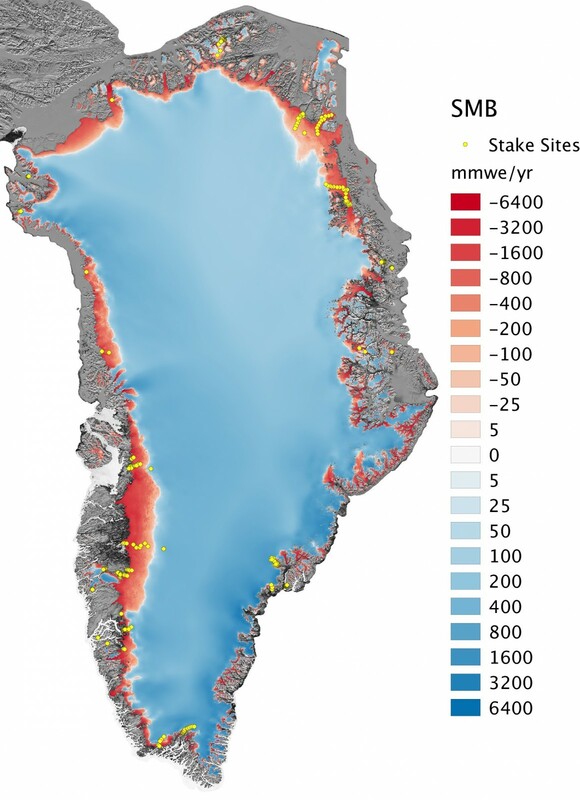 For now, the big Greenland ice sheet is still safe as snow in the extensive inland accumulation zone still buffers most of the summer melt (Fig. 1). At the current rate of mass loss (~300 Gt per year), it would still take 10,000 years to melt the ice sheet completely (van den Broeke et al., 2016). However, the tipping point reached for the peripheral ice caps must be regarded as an alarm-signal for the Greenland ice sheet in the near future, if temperatures continue to increase. The daily, 1 km Surface Mass Balance product (1958-2015) is available on request without conditions for the Greenland ice sheet, the peripheral ice caps and the Canadian Arctic Archipelago. Noël, B., van de Berg, W. J., van Meijgaard, E., Kuipers Munneke, P., van de Wal, R. S. W., and van den Broeke, M. R.: Evaluation of the updated regional climate model RACMO2.3: summer snowfall impact on the Greenland Ice Sheet, The Cryosphere, 9, 1831-1844, doi:10.5194/tc-9-1831-2015, 2015. Noël, B., van de Berg, W. J., Machguth, H., Lhermitte, S., Howat, I., Fettweis, X., and van den Broeke, M. R.: A daily, 1 km resolution data set of downscaled Greenland ice sheet surface mass balance (1958–2015), The Cryosphere, 10, 2361-2377, doi:10.5194/tc-10-2361-2016, 2016. Noël, B., van de Berg, W. J., Lhermitte, S., Wouters, B., Machguth, H., Howat, I., Citterio, M., Moholdt, G., Lenaerts, J.T.M., van den Broeke, M. R.: A tipping point in refreezing accelerates mass loss of Greenland’s glaciers and ice caps, Nature Communications, 8, 14730, doi:10.1038/ncomms14730, 2017.